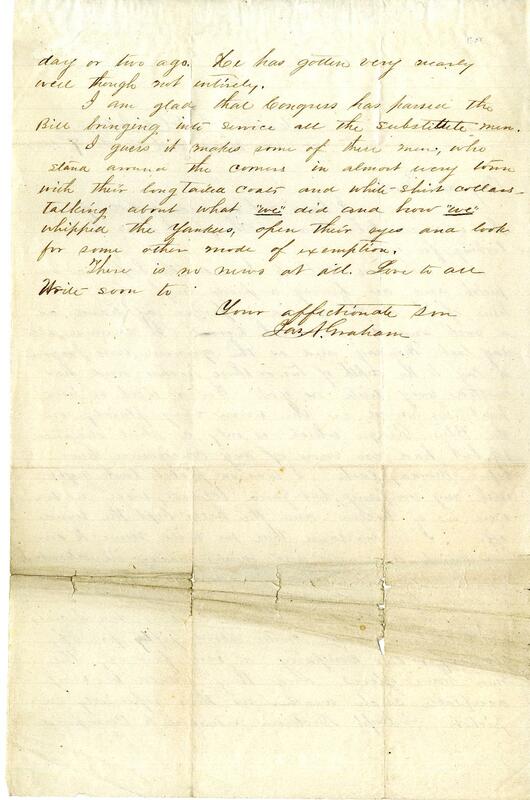 Item description: Letter, dated 7 January 1864, from James A. Graham to his mother. Item citation: From the James A. Graham Papers #00283, Southern Historical Collection,The Wilson Library, University of North Carolina at Chapel Hill. I have not received a letter from home since Christmas although I have been looking for one. We are still up here on the Rapidan on picket and are having a pretty rough and cold time of it as the ground is frozen as hard as a rock and covered with snow. It snowed all day last Monday and as the ground was frozen it lay to the depth of two or three inches and has melted very little as yet. For a week or two past we could see the snow very plainly on the Blue Ridge which is only a short distance off, but had no snow of any consequence here before Monday last. I was on picket last night with my company, but fared tolerably well as we were in a hollow and the hills kept the wind off. I understand that we will move to our new Camp and to into winter quarter in about two weeks and then I expect we will have a good time. I wish our Ladies Solidiers Aid Society in Hillsboro would make about fifty prs of gloves for our Company as very few of the men have gloves and they would be very acceptable such weather as this especially on picket. Capt. Dickson returned to Camp a day or two ago. He has gotten very nearly well though not entirely. I am glad that Congress has passed the Bill bringing into service all the substitute men. I guess it makes some of these men, who stand around the corners in almost every town with their longtailed coats and white shirt collars talking about what “we” did and how “we” whipped the Yankees, open their eyes and look for some other mode of exemption. 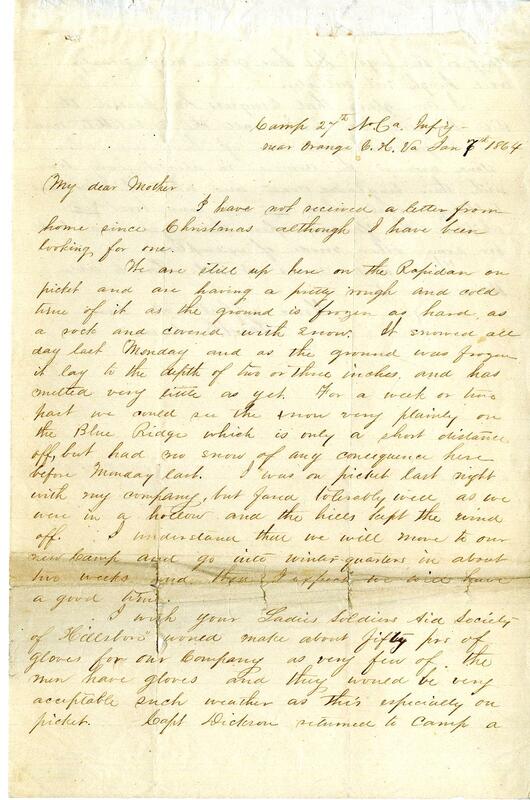 This entry was posted in Southern Historical Collection and tagged 27th North Carolina Infantry Regiment, clothes, Hillsborough (N.C.), James A. Graham, ladies' relief societies, substitutes, weather, winter, winter quarters. Bookmark the permalink.